Mi Familia Vota was born out of the labor movement and we keep our fight for workers’ rights as one of the top priorities of our work. We were born out of the labor movement. 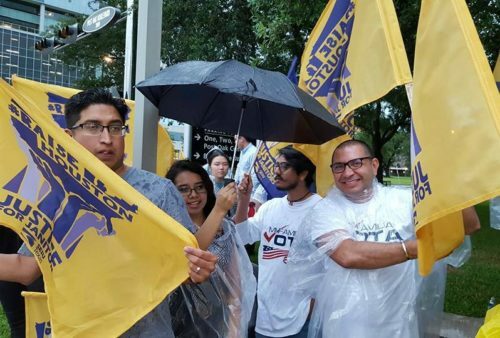 From the Fight for $15 to fighting for Family and Sick Paid Days, Mi Familia Vota is part of national and local coalitions, campaigns, and mobilizations advocating for workers’ rights. The United States scores at the bottom of the list compared to other nations when it comes to providing working families access to paid leave. While momentum has grown over the last couple of years to update our national laws and provide more workers with access to paid leave, there are still many workers without access to a single paid sick day. This burden weighs most heavily on low-income workers and Latinos who are often employed in jobs that do not offer paid leave. To learn more about paid family leave and paid sick days, download our toolkit here. This toolkit can be used by organizations and individuals to raise awareness of paid sick days and paid family leave among the Latino community. The contents of the toolkit are a mix of traditional and online materials which will be tested in Latino markets across the United States. Our hope is that by raising awareness, the Latino community and our allies will be empowered to continue the fight for access to paid leave.